What Day Of The Week Was May 18, 1974? 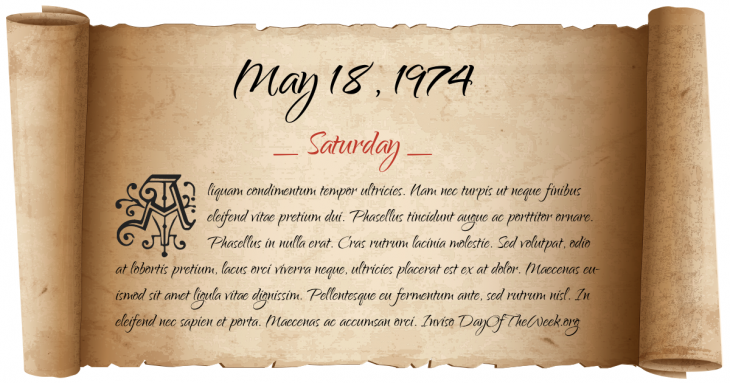 May 18, 1974 was the 138th day of the year 1974 in the Gregorian calendar. There were 227 days remaining until the end of the year. The day of the week was Saturday. A person born on this day will be 44 years old today. If that same person saved a Penny every day starting at age 7, then by now that person has accumulated $138.51 today. Completion of the Warsaw radio mast, the tallest construction ever built at the time. It collapsed on August 8, 1991. Nuclear test: under project Smiling Buddha, India successfully detonates its first nuclear weapon becoming the sixth nation to do so. Who was born on May 18, 1974?